Universidad Sergio Arboleda has promoted the creation of the international Center of Excellence in Madrid, in order to reinforce the international training of the students as well as to work as the bridge between Colombian and European societies. The International Centre of Excellence is composed by the training Centre for the knowledge exchange and business, cultural, economic, and social development among Spanish and Colombian companies firstly, and Latin American and European secondly. Letter from the University Sergio Arboleda in Spain delegate. 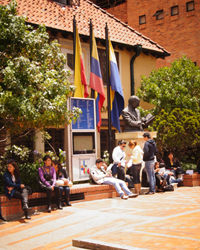 “University Sergio Arboleda has been working in Colombia since 1985 and ever since, during those three decades, it has grown and evolved just like the rest of the country. We have a solid experience based on the effort and sacrifice of many people. Because of that, we are convinced that we can foster the same circumstances in Sapin. Now is the moment, due to the fact that we are presenting and educative product, different and successful, and we want Spain to be our ski jump. University Sergio Arboleda wants to promote the internationalization of their students through its Center in Madrid, blending the education inside the classrooms with an international experience in Spain. 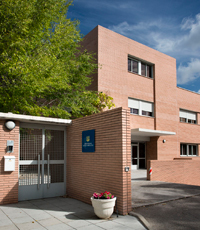 The programs taught in Madrid incorporate teaching hours at the center with activities aimed to connect, directly with the Spanish and European reality, along with the one-on-one relations with their companies and institutions. Another objective is to live the history while it is being produced. The activities done in Madrid Centre will complement a different set of activities aimed to uplift the student’s education. We are going to schedule visits to several historic and cultural places that turn our program into a whole new experience in terms of knowledge from Spain and Europe as well, always aiming to the goal of movements and connections with Colombia. We will definitely be the focal point of mutual intercontinental knowledge. “.